Karkala, Nov 5, 2015: A youth who reportedly touched a woman unintentionally while paying the bill at a grocery shop in Salmara, was thrashed badly by the woman’s husband who happened to be the sub-inspector of Karkala town police station. The incident took place on November 3, Tuesday night. It is learnt, the woman had soon complained against the youth identified as Raghavendra Moily (28) from Kukkundoor, to her husband who was an SI and the latter without a thought had reportedly slapped Raghavendra several times despite the plea of the shopkeeper against it. It is said the youth was also taken to the station and beaten up. The victim has suffered a fracture of his index finger and injuries on his hips and has been admitted to a local government hospital. Raghavendra worked for a private finance company and was awaiting a bank job following the recent demise of his father, a bank employee. 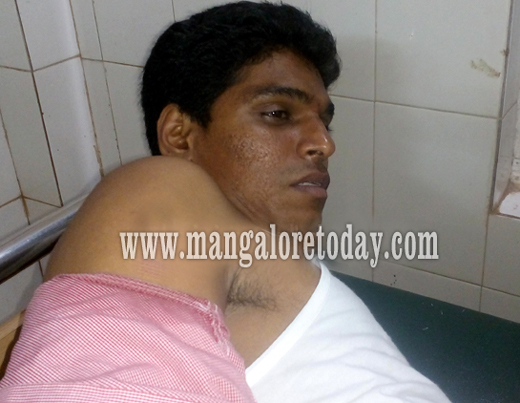 Former MLA Gopal Bhandary has visited Raghavendra in the hospital. The taluk Devadigara Sangha has also taken up the issue and its President Ravishanker Sherigar has said the Sangha has spoken to the SP Annamalai and that a complaint would also be lodged with the taluk magistrate. The accused SI Imran has however refused to comment on the issue.